The most riotously enjoyable Marvel movie yet, this action epic benefits hugely from the decision to let wacky New Zealand filmmaker Taika Waititi loose with the characters. In many ways, this film has the same comical sensibilities as his classics What We Do in the Shadows and Hunt for the Wilderpeople. Except on a much larger scale with massive special effects. Yet even with all this action, there’s not a moment of actual suspense, which is a growing problem in a movie universe in which the characters need to survive unscathed. Ragnarok is a prophecy about the end of time, specifically the death of King Odin (Anthony Hopkins) and the destruction of Asgard. And it has just been triggered, stopping Odin’s sons Thor (Chris Hemsworth) and Loki (Tom Hiddleston) in their tracks with the news that they have an older sister, Hela (Cate Blanchett), the self-proclaimed goddess of death. 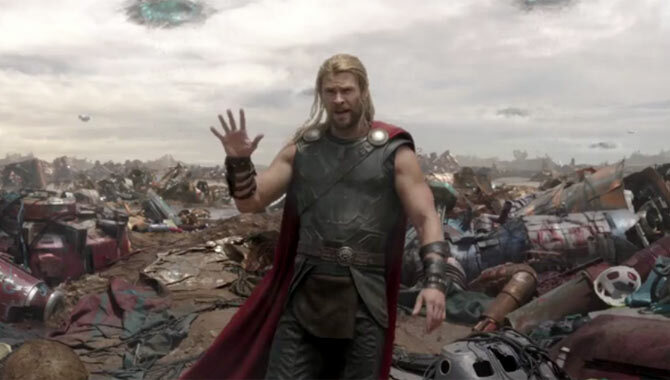 As she brutally asserts her claim to the throne, the brothers find themselves dumped on the planet Sakaar. Loki mischievously worms his way into the favour of the Grandmaster (Jeff Goldblum), who sends Thor into the coliseum to fight the champion, namely his old friend Hulk (Mark Ruffalo). As Thor convinces Hulk’s alter-ego David Banner to return with him to Asgard to stop Hela, he also needs Asgard’s last Valkyrie (Tessa Thompson), a tetchy warrior who is reluctant to work with him. While the plot sounds fairly standard for these kinds of films, Waititi directs it in an unusually loose style, infusing all of the interaction with hilariously offhanded comedy from start to finish. This means that even the most intense scenes have a strong dose of refreshing silliness to balance the relentless hand-to-hand violence. The big battles are produced in eye-popping ways with colourful effects and outrageous stuntwork, but they’re all somewhat exhausting simply because the outcome is never remotely in doubt. Thankfully, the characters are so strong that we’re completely gripped. It’s great to see Hemsworth and Hiddleston play much more engagingly with Thor and Loki’s strained sibling rivalry. And Ruffalo brings Hulk/Banner to life with more personality than we’ve seen before. For comedy value, it’s hard to beat Goldblum and Waititi himself (as the rock-beast Korg). But it’s the women who steal the show: Blanchett is snaky and vicious, impossible to look away from, while Thompson creates one of Marvel’s feistiest, most likeable heroes. There are also a lot of great cameos along the way (including Cumberbatch as the amusingly snarky Dr Strange). So while there’s never any worry about where the story is heading, it’s an almost criminal amount of fun while it lasts.